Incremental Sheet Forming is a promising process for the small batch manufacturing of sheet metal parts due to its flexibility and to the high formability achievable. In the Incremental Sheet Forming process a localised state of deformation is imposed by the CNC controlled motion of a simple tool. Although the process potentiality, its industrial application is still bordered by some drawbacks such as excessive material thinning, part inaccuracy or process time. 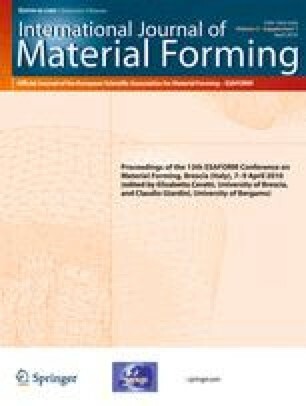 In the last years, several works were carried out by the researcher all over the world mainly focused on material formability. However further efforts are required in order to overcome the above specified drawbacks. In particular, concerning the material thinning, the simple Sine Law allows to predict the actual sheet thickness in a rough way. In fact, the Sine Law takes into account the initial thickness and the wall slope angle, neglecting all the others process parameters. For this reason, a more robust tool which takes into account the whole process complexity is strongly necessary. In this paper a wide investigation on 6082-T6 aluminium alloy was carried out with the aim to determine the influence of process parameters on thinning behaviour. Finally, with the aim to obtain a reliable model to predict the thinning, the ANOVA analysis was executed on the experimental data designed by DOE. All the other details are reported in the paper.